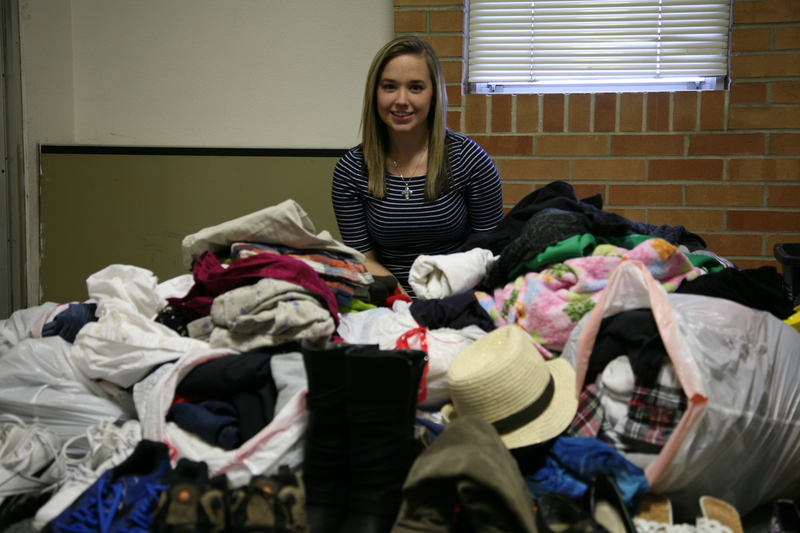 Trish Harwell poses buried in a pile of donated clothing she collects in her Holmquist residence hall room. Every student on MSUM’s campus has the opportunity to make a difference, create a positive impact, change someone’s life and pay it forward every day. Even small things, such as a simple smile or picking up litter around campus, can make an immense difference. Trish Harwell, a social work senior, took an opportunity to make a difference in the Fargo-Moorhead area. With over 233 articles of clothing currently collected, Harwell created a project to donate MSUM students’ second-hand clothing to a non-profit organization. She came up with the idea when her family was sorting though clothing to sell at a garage sale. Left in despair, Harwell came up with the idea of finding a completely non-profit organization to donate her families clothing to. Harwell decided on Fraser, Ltd., the longest serving non-profit organization in North Dakota. Fraser, Ltd., is located on 2902 University Dr. S, Fargo. SSRC provides a safe environment where young people can receive food, hygiene products and clothing; find healthy and safe ways to spend time off the streets through recreational, social, leisure and artistic outlets; and utilize desktop computers to search jobs, prepare resumes, take skill training courses, work on homework, etc. In addition to these services, SSRC offers case management services, ranging from help locating a GED testing center to assistance with college entrance. In addition to independent living skills, SSRC case managers offer therapeutic services providing opportunities to discuss issues that hamper the health and positive outlook a center guest experiences, while providing a chance to set goals and work towards desired outcomes with a licensed practitioner. “I thought it was unique because I have never heard of anything like that before.” Harwell said. She has been currently contacting mostly individual MSUM students for donations. She contacted MSUM students, on-campus sports teams, organizations, the fraternity and both sororities for clothing donations. “I have had people contact me on Facebook, I posted it on different MSUM groups on Facebook, and people contacted me on that and met up to give their clothing donations,” Harwell said. She is expecting Sorority Delta Zata to still drop off 66 articles of clothing. Harwell is thinking of contacting Ignite Church as her next stop because over 300 people attend. With the craziness of being a senior and doing this project on the side, Harwell is only available for collecting until Nov. 18. “If I were on campus longer I would love to start an organization to further the project, but I don’t think I could get it all done in time,” Harwell said. She will be leaving in December for Carver County (Minn.) to intern in child protection. Harwell will be doing her internship in the spring and graduating in May. “Anyone that wants to make a difference and donate should, because this is going to a really great cause,” Harwell said. To donate, contact Harwell on Twitter, Facebook, or email her at kempkestr@mnstate.edu. In addition, she allows potential donors to find her in person and visit her at work at the front desk in the math department on campus. For more information about Fraser, Ltd., visit their website at fraserltd.org or call 701-232-3301.